At my crisis line training tonight, we discussed trauma and the trauma response. Part of managing trauma is managing triggers from trauma. I am not saying that surviving sexual abuse/domestic violence is the same experience I have from feeling abandoned. Clearly, they are vastly different. However, I found the information useful in understanding my own experience and ways of managing triggers. 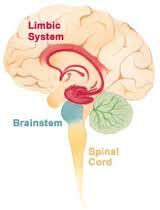 Your brain stem is formed first in the womb. It controls basic bodily functions (heart beat, breathing, etc.). Your limbic system is formed next. It controls your sensory processing, processing short-term memories and moving them into long-term memory storage, decides if you are in danger, and tells you how you feel. Your neocortex is formed afterwards, which is your “thinking” brain- it controls higher level thinking and reasoning. Whoa! This just makes so much sense to me with how I am still having flashbacks and intense emotional reactions to just thinking about the messy and traumatic break-up from this summer. I feel encouraged to try to process my feelings in some other ways besides journaling and talking (like drawing or sculpting) to see if those non-verbal outlets might help relieve my triggers and reactions. Having grown up in a highly psychology-trained household, my mom and I both have come to the conclusion that verbal counseling is not helpful for either one of us. We know how to act like the “good patient” and our minds are capable of tricking us out of any of the benefits of that type of counseling. I have had remarkable success with alternative types of healing work like Reiki, acupuncture, yoga & meditation, and network chiropractic work. There are a lot of other types too. I recommend giving it a try. Some healing needs to come from a place within us that is not the brain, but rather, releases energy blockages from other parts of the body. IF you want recommendations for people I've had work from, I'm happy to share!